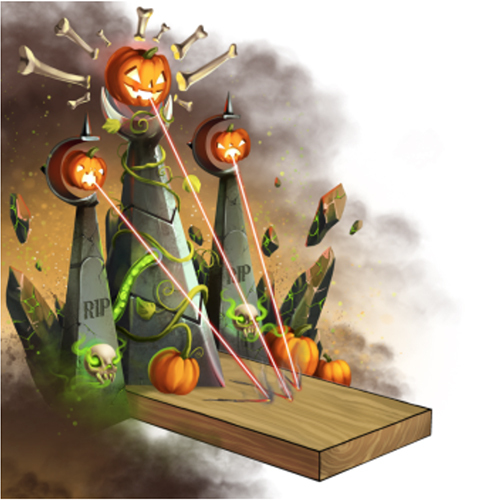 Sitting atop the graves of fallen heroes, these pumpkins act as focusing devices that allow the souls buried underneath to channel their powers outwards. Burning with anger? desire for revenge? or a sense of justice whose light changes those it touches to good? Perhaps it is determined by the spirit of the hunter who wields it? The Haunted Spires Skin can be used on the Multi-Crystal Laser trap. The trap's stats (power, power bonus, attraction bonus, etc.) are not changed. The Haunted Spires Skin may be made available during the annual Halloween event and can be traded on the Marketplace or through Give To Friends. 14 October 2014: The Haunted Spires Skin was introduced as part of the Halloween 2014 event..